It might not look good when you squeeze all elements from desktop mode to a smaller screen. It might turn out that in other versions you don't necessarily need all the elements. The layout of a website will differ in different modes so make sure it suits your needs and is user-friendly. Hiding elements is very easy. All you have to do is click an icon. At the top of the builder select any RWD mode. Enter layers at the bottom right corner of the builder and set elements visibility on a particular mode. All you have to do is click on an icon with the device. 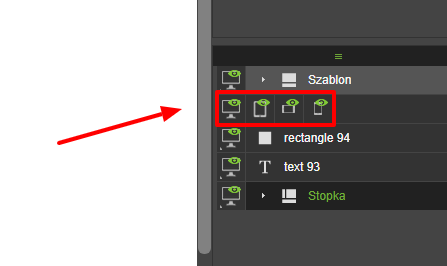 To see more RWD website versions select "Desktop" icon in layers. Unmarking icons from e.g. vertical mobile mode will hide elements on a subpage, where they were done. Hiding group of elements works the same way. Changing elements visibility on certain modes is not hard at all and it is very useful. This feature is particularly helpful when you want to hide elements which aren't necessarily needed in smaller screen mode.